Iran has announced that it will open two new uranium-processing facilities on Tuesday as Western efforts to convince Tehran to abandon its nuclear program ended in failure last week. Iranian President Mahmoud Ahmadinejad is preparing to inaugurate the "Saghand uranium complex near the Central city of Ardakan and Shahid Rezayeenejad Yellow Cake production facility" on Tuesday to mark the regime’s "National Day of Nuclear Technology," according to Iran’s Fars News Agency. Western nations including the United States have urged Iran to stop enriching uranium to levels that would be needed to fuel a nuclear bomb. "Uranium ores are extracted from the depth of 350 meters in Saghand mine near Ardakan and is then sent to Rezayeenejad complex to be converted into Yellow Cake," Fars reported. An International Atomic Energy Agency (IAEA) spokesman did not have immediate comment on the announcement, directing a reporter to the agency’s reports on Iran, which show that the regime has made consistent progress on the nuclear front. The spokesman added, "Uranium processing is different than enrichment." The new processing plants would constitute a violation of multiple United Nations Security Council Resolutions aimed at stopping such activities, according to Emanuele Ottolenghi, an Iran expert at the Foundation for Defense of Democracies. "If Iran’s declared intention to inaugurate two new uranium processing facilities is true—and not just the usual bluster—then these steps represent not only a violation of UN Security Council Resolutions but also yet another Iranian provocation," he said. "For 10 years, an agreement has eluded nuclear negotiators. All the while, Iran has expanded its nuclear activities and edged ever closer to nuclear weapons," Ottolenghi said. "The failure of talks in Almaty, Kazakhstan, last week, only heightens the sense that diplomacy is at a dead end, and with Iran further expanding its nuclear activities, the point of no return may indeed be nearing." The opening of the facilities comes as Western nations failed to convince Iran to halt enrichment activities during multi-lateral talks last week. Catherine Ashton, the European Union foreign policy chief and top Iran negotiator, said talks failed to produce a major movement and that Iran and the West remain "far apart on substance," according to the Guardian. "Over two days of talks we had long and intensive discussions on the issues," Ashton said following the talks, which took place in Kazakhstan. "It became clear that our positions remained far apart." "We have therefore agreed that all sides will go back to capitals to evaluate where we stand in the process," Ashton said. 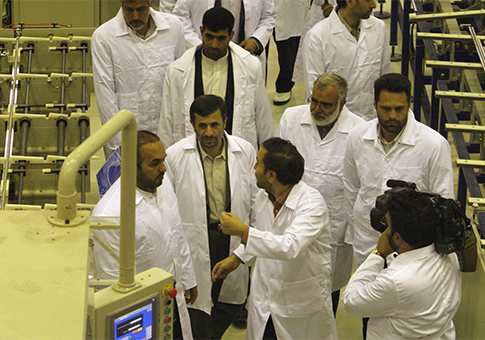 Iranian officials stated that the regime would not relinquish its "inalienable right" to enrich uranium. "Accessing peaceful nuclear know-how is an indisputable right for Iran and the Iranian nation will defend its rights in all fields," Alaeddin Boroujerdi, head of Iran’s Majlis National Security and Foreign Policy Committee, was quoted as saying by state organ PressTV. President Barack Obama recently declared that Iran is more than a year away from developing a nuclear weapon, progress that would cross a so-called "red line" for the administration. Former CIA Director General Michael Hayden recently said he has begun to view a preemptive U.S. strike on Iran’s nuclear sites as the "least worst" option to stop the regime. This entry was posted in National Security, Politics and tagged Air Force, Barack Obama, European Union, International Atomic Energy Agency, Iran, Middle East, Nuclear Weapons, Obama Administration. Bookmark the permalink.